The Republic of Singapore Air Force (RSAF) and Defence Science and Technology Agency (DSTA) have completed their technical evaluation to select the next generation fighter to replace its F-16s. The F-16s will have to retire soon after 2030 and the F-35 Joint Strike Fighter (JSF) has been identified as the most suitable replacement to maintain the RSAF's capabilities. However, the technical evaluation also concluded that the RSAF should first purchase a small number of F-35 JSFs for a full evaluation of their capabilities and suitability before deciding on a full fleet. 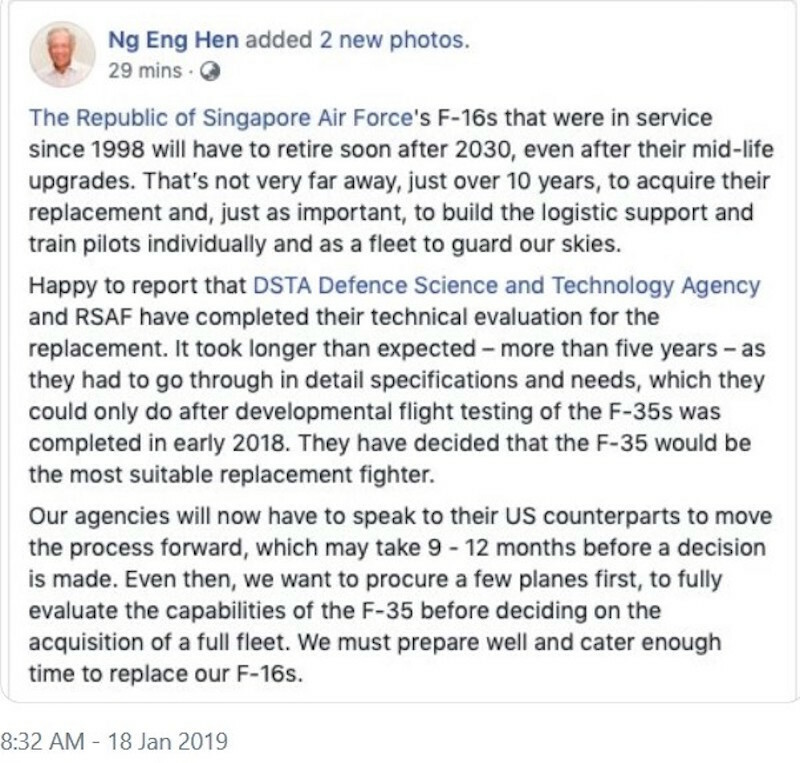 In the next phase, MINDEF will discuss details with relevant parties in the US before confirming its decision to acquire the F-35 JSFs for Singapore's defence capabilities. 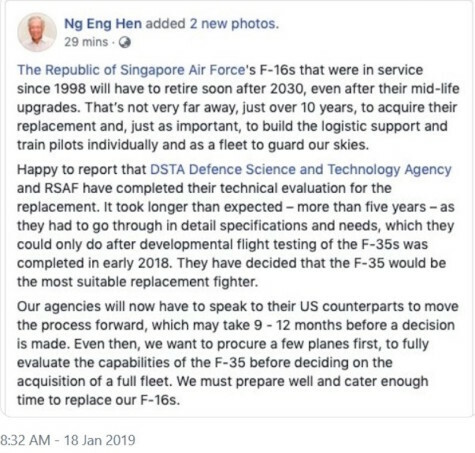 (EDITOR’S NOTE: Singapore’s selection of the Lockheed F-35 to replace its F-16 fighters is not a surprise, and was indeed widely expected. However, its decision to buy “a small number of F-35 JSFs for a full evaluation of their capabilities and sustainability” was not, and is a clear demonstration that, like many others, Singapore is not convinced that the F-35 can deliver all that its manufacturer and the Pentagon have promised. Indeed, its decision to “fly-before-buy” – a process that the Pentagon disregarded for this and other troubled programs – is probably unprecedented for an export sale of combat aircraft in the post-war era. Is Joint Cargo Aircraft Worth Its $5bn Price Tag?